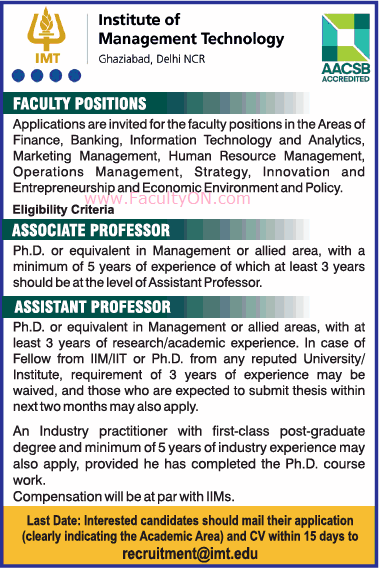 Institute of Management Technology, Ghaziabad has advertised in THE TIMES OF INDIA newspaper for recruitment of Associate Professor / Assistant Professor jobs vacancies. Interested and eligible job aspirants are requested to apply within 15 days from 5th December 2018. Check out further more details below. About College : Institute of Management Technology, Ghaziabad abbreviated as IMT, is a business school with its main campus at Ghaziabad in the Indian state of Uttar Pradesh. It is consistently ranked as one of India's best business schools. How to Apply: Interested and eligible candidates are required to send CV, copies of certificates along with recent PP size photo the email address mentioned below. Clearly mention the academic area in your email.